Importance. -- Adults and nymphs feed on white oaks from Alabama and the Carolinas to southern Canada. By the end of August, the leaves may be discolored and perform little photosynthesis. Identifying the Insect (figure 37). -- Nymphs are black and covered with spines. Adults have broad, transparent, lacelike wing covers; flattened; and about .25 inch (6 mm) long. Identifying the Injury. -- Infested leaves have chlorotic flecks on the upper side of the leaf. Heavily infested trees may be partly defoliated, especially during dry weather. Biology. -- Adults overwinter in bark crevices and similar protected areas of their host. During the spring they attach eggs to the underside of leaves. 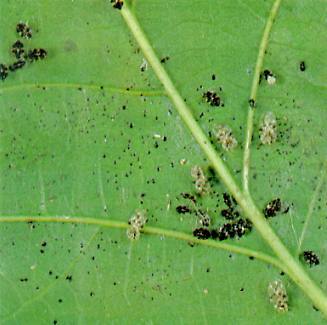 Upon hatching, nymphs begin feeding on the underside of the leaf. A complete cycle from egg to adult may occur in 30 to 45 days; several generations occur each year. In late summer, all active stages may feed together. Control. -- Natural enemies are usually effective. Chemical controls may be needed on shade and ornamental trees. Figure 37. -- Adults and nymphs of oak lace bug.